<< Back TAMIYA "Ferrari F189 Portuguese G.P." TAMIYA "Ferrari F189 Portuguese G.P." 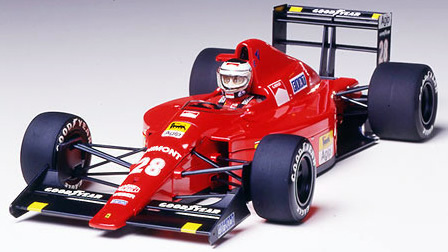 To comply with the drastic regulation changes that took effect starting the 1989 F-1 racing season, the Ferrari team brought out their revolutionary F189 type 640 machine. Designer John Barnard and his staff have successfully developed a unique but very effective racer. The very esthetic body styling resembling a vase when viewed from above, is the result of extensive wind tunnel testing, and is said to provide better internal airflow. The normally aspirated, 3.5 liter displacement powerplant is Ferrari's traditional 12 cylinder in a V format, and incorporates 5 valves per cylinder. One of the more controversial features of this racer is the semi-automatic gear box. It is an electronically controlled, seven-speed gear box that aides the awesome powerplant in keeping its RPM powerband viable during all out competition circuit runs. The system is activated by a rocker located behind the steering wheel. The conventional clutch pedal is still present, but it is used only for starting the racer. The shock absorbers for the front push rod suspension system are mounted on top of the front monocoque section, enabling the racer to obtain an exceptionally narrow nose. When combines with the remarkable talents of drivers Nigel Mansell and Gerhard Berger, the Ferrari F189 has delighted motorsports fans with first class performance throughout the 1989 season.